Birthday emails are a favorite tool in the word of email marketing. They're an easy way to make your customer feel good (unless someone doesn't like being reminded it's their birthday). Now, it's easier than ever to send a birthday or anniversary email with our same great email marketing software. We've added a feature that allows you to send an automatic birthday email to each of your subscribers on their special day. Typically, businesses like to offer their subscribers a discount, or even free goods, as a gift of sorts. You will need to create date field in your subscriber sign-up/add contact process to enable this option. If you already have one, you're ahead of the game. If not, you can ask a new subscriber to enter their birthday in your online sign-up box or manually enter them to your existing lists. Once the date field exists in your list, you can follow these steps to create and send a birthday campaign. Click on the Emails tab. Then click on the Autoresponders option. To create a new autoresponder, click on the Create An Autoresponder button. Select a list (make sure it has a date field) and click on the Save & Next button. Check the Annual Email option and select the correct date field from the pull-down menu next to Use This Date. Click on the Continue button. Select a template that suits your requirements from the list of templates. In case you have your own HTML, click on Use Own HTML. Click on the Save & Next button to continue. You can update the subject line and adjust the number of days either before or after your selected date to send your email. If you want to send the email on their birthday, select 0 from the days in the drop down menu. You can update your content in your email. Once you have made your changes click on the Finish button. 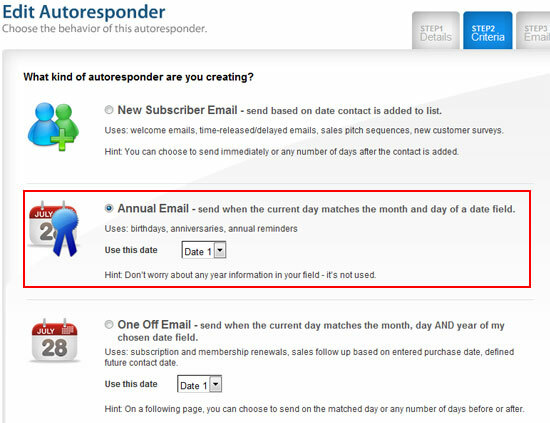 Once you activate the autoresponder by clicking on Activate The Autoresponder You Created option, your birthday wish emails will be sent automatically to the members of your list on the appropriate days. Since this type of autoresponder only sees the day and month in your date field, these emails will be sent every year, year after year, until you stop it. The new autoresponder section isn't just for birthdays and anniversaries. It also has a one-off-email feature that can also be used for sending emails reminders on or around a date according to month/date AND year. This is useful to automatically handle things like subscription renewals, purchase date follow ups and expiring account notices. 6 Nuovi Video Tutorials di Benchmark Email!